The reason why I wanted to organise a workshop with Alexandra Kurland around Anja Beran’s Classical Dressage Workshop was a very selfish one, as it often is. Alexandra and Anja are my horse heroines and all that I do around horses is inspired by them. Having both of them together for a whole week, was just the best thing I could imagine. And it was! If you know their work only superficially, you may not see the commonalities. Alexandra has pioneered clicker training for horses. She micro splits any training step into so many micro slices, that you may lose the purpose of the exercises as a whole and where this work leads to. 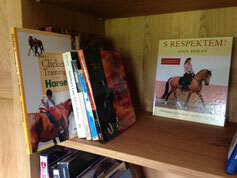 Anja’s work on the other side is coming from old riding masters and century-old knowledge about training horses. She shows beautiful riding that everyone must admire but you may think you will never be able to reach this level of riding. The steps seem just unreachable. How could you ever teach your horse a perfectly balanced piaffe when you can’t even get a decent working trot. But they both have many things in common. Their underlying belief system is congruent: they believe that horses are intelligent creatures that deserve to be treated with care and love. Training must be to their benefit first of all. Their training has similarities: they both use antecedent arrangement to make the horse successful, splitting the training goal into small steps, progress is marked and reinforced and if the horse does not show the desired response, then the exercise is either repeated or changed to a different one in which the horse can be successful. Punishment is avoided. Both of them learnt from Nuno Oliveira students and their approach to classical dressage is therefore quite similar. I always say that in my training, I get the WHAT from Anja and the HOW from Alex. I call that jokingly "A2 training". Anja’s work directs me to which exercises I need to train in order to achieve better balance. One of my horses generally leans on his right shoulder and brings his croup to the left. In order to put him straight and in balance, I need to shift weight off his right to his left shoulder and keep his croup straight so he can push himself forward in a straight line. 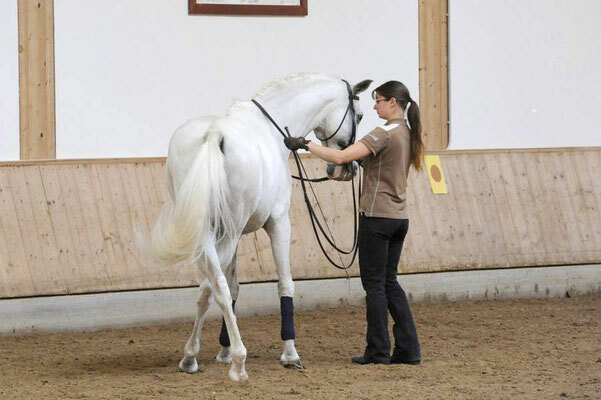 Based on classical dressage, there are a number of lateral movements to achieve this. But in order to use e.g. a shoulder-in for straightening my horse, I need to teach a shoulder-in first. Anja teaches a young horse shoulder-in with help from the ground. The rider will keep the horse along the long side of the arena, bring the shoulder in, and Anja will stand in front of the horse, so he can’t walk forward and she will help with a whip to encourage a step to the side. A correct response is marked and reinforced by a release. Repeat. Most of us don’t have help from a second person and we may not have the experience of where to stand, where to touch and when to release. It also takes a very good communication between the rider and the person on the ground. They both have to release at the exact same moment. Alexandra gives us a very structured systematic approach to teach shoulder-in starting from the very beginning. She teaches us how to use the halter and lead rope in a gentle, efficient and elegant way, we learn weight shifts, forward, backward and sideways. We explore jaw flexions and bends and continue to shoulder-in without even realising. It just pops out! We explore the process rather than fixating our minds on the outcome “shoulder-in”. This way it evolves naturally, we progress to the next level not because that’s what is in the textbook but because the next step is already there. This teaches us a great level of awareness of the subtle balance shifts that are necessary to perform a certain movement, shoulder-in or something else. We explore this on the ground, which builds muscle memory into our own body, and then in the saddle. And there we have shoulder-in although there is no “Shoulder-in lesson” in Alex DVD series. Yet, it’s been there all along. Now that we have gone through the teaching process, I can use shoulder-in to straighten my horse and to shift his weight from the right shoulder, which carries more weight than it should, to the left shoulder. By doing this, I prevent lameness in the right front leg from carrying excessive weight. The shoulder-in will also keep his croup in, engage his right hind and he will start using his back. He will start chewing and his top line will become rounder. The other lateral movements evolve naturally from this once the shoulder-in is in repertoire. An exercise that Anja recommends very often is called “Übertreten”, sometimes called “overstepping” in English or “Pluvinel Volte”. It is basically leg yielding on a volte or circle (with more bend on the stiff side). You perform it in a slow movement in walk or trot. To do this movement, the horse needs to bend the joints of his hind legs and cross over, opening and closing the hip joint. He will engage his back and start chewing when done correctly. However, this is not an easy movement when you start. The horse may either fall on the outside shoulder or fall forward into the circle or creep backwards. Again Anja helps from the ground when she teaches this movement. If you are alone, it is easy to teach from the ground but riding is much more difficult. You need to control the shoulders and prevent falling forward. To avoid pulling on the reins, you need to teach it smartly. Also in this case, Alexandra has already given us all the necessary steps. When teaching shoulder-in, you have already gone through some of the necessary steps. The next lesson you need is “Hip-Shoulder-Shoulder” (HSS). HSS collects your horse in a balance that allows collected movement in ANY direction: forward, backward or sideways. If you prepare your horse with a HSS, you can then ask him to go sideways into a “Übertreten”, which is an excellent warm up and security exercise should your horse spook or be overly energetic. It is also an essential preparation for Piaffe. "Hip-Shoulder-Shoulder" (HSS) is a balance reset that creates the necessary equilibrium for basically any movement that follows. With a HSS you can prepare, for example, the first step into "Übertreten" or use it as a reset if you have lost balance. In this clip, HSS is in training. When the HSS is in repertoire you can cue the next step in a clickable moment, i.e. instead of a click and treat, you cue the next behaviour. This beginning Piaffe was trained through HSS resets and prepared by loads of "Übertreten". Once the idea of the movement is there, shaping does the rest. I understand that not everyone is interested in dressage. You may be interested in trail rides or prefer groundwork. But as long as you decide to ride, you have to understand balance. You need to teach your horse how to move under a rider to stay sound. A horse that constantly overloads one shoulder will end up lame or that hollows his back under a rider will have back pain in the long run. And if you decide not to ride, you may still need to work his muscles in a healthy way so that he stays strong and healthy. Classical dressage helps you achieving this and is therefore worthwhile studying even if you are not interested in riding a piaffe or canter pirouette. You don’t need to train the exercises in a correction-based style. Use your modern training skills to teach exercises that have a long history of being beneficial to horses. Alexandra has developed all the component parts that you will need to teach them and there is room to change and adapt to your horse and your situation. 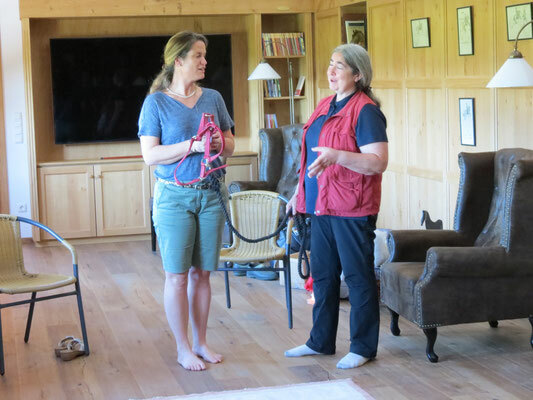 During two days around Anja Beran’s Classical Dressage Workshop, Alexandra introduced us to “Microriding”. Actually, we started “Macro” by doing body awareness exercises that her regular clinic participants all know very well. That was a good preparation for the micro movements that followed where only thoughts created changes in body alignment. It was quite spectacular to observe these tiny changes which were invisible at the onset and sometimes quite visible by the end of the day. It is also enlightening how little a movement, just a thought, can be a cue for the horse. Watching Anja Beran or Vera Munderloh ride, you can imagine how small their cues are, because you just can’t see any movement. For a example, for a transition from piaffe to passage, Anja’s instruction to the rider was “Think passage”, and it happens. You can always refine your cues. Vera has started riding side saddle because she wanted to know how little cuing she needs. 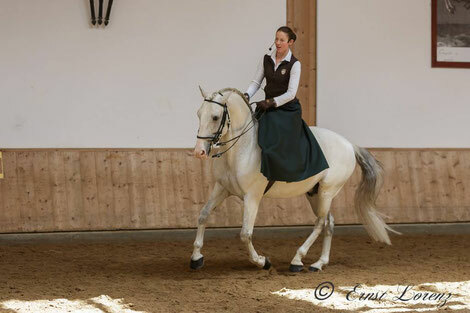 In the side saddle you have basically no leg cues, only voice, weight, reins, a very short and fixated leg and a whip and yet she is able to ride lateral movements in all gaits, piaffe, passage and canter pirouettes. Vera says riding in a side saddle helps her to further refine and use even smaller cues. Microriding first convinces you that a thought is enough to create a change, then it teaches you how to use this in the saddle or on the ground to communicate with your horse on a very subtle level. And the smaller your cue, the easier it is for your horse to keep or find his balance because you are more balanced and a change in that balance becomes more significant. This links well to one of the Feldenkrais principles which states that if you lift a metal bar, a fly landing on it does not make much of a difference. But a fly landing on a feather changes the balance quite significantly. In a micro movement, a tiny shift in balance is signifiant. But in a macro movement, that same shift is meaningless and the horse learns to ignore it, if he’s aware of it at all. You can read more about Microriding on Katie Bartlett's website or get Alexandra's DVD Lesson 15. 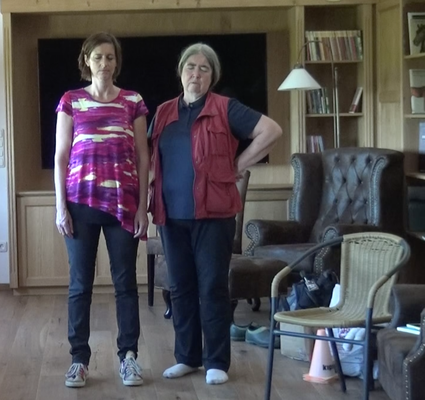 This year's focus of Anja's Classical Dressage workshop was "Train your eye". Anja has developed videoclips that help you to see correct movement. Anja's team went to film actual high level competition riders, anonymised them, and coloured the diagonal pairs of legs. Then they did the same with horse/rider pairs trained classically. 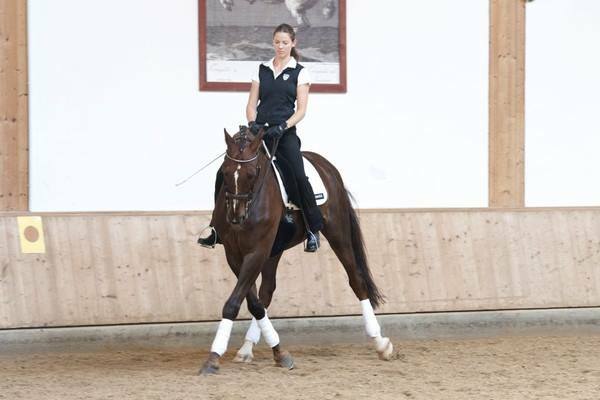 Anja showed videos of different movements such as walk, extended trot, passage, piaffe and canter pirouette. Looking at these videos isolated and then in comparison made it really obvious where things go wrong. Although dressage should maintain or improve a natural gait, we saw gaits that were completely destroyed. The legs moved sometimes completely isolated when the pairs should be synchronised and in rhythm. This is a shortened version of the video that Anja produced to show specifically the "Train your eye" videos. The full video about the seminar that Anja organised together with Jana Lacey-Mandana at Circus Krone in November 2015 is accessible here (in German). To watch a second clip of the same event with English subtitles click here. This clip illustrates the benefits of classical dressage for the long term soundness of our horses. It is a great help to look at the videos but also without the videos there are ways to “get an eye” for correct movements. Go to excellent riders, really good ones, and watch them ride. And watch some more, and even more and then more. Get into the habit of watching correct and healthy movement. You can test if you have “trained your eye” by watching a Grand Prix dressage test. Does it seem light, elegant and in harmony? Or heavy, tight, strenuous and “wrong”? Then if you can see a difference, even if you don’t really know what the difference is, watch the video in slow motion. Choose a moment where you felt some glitch, something stuck and uneven. Watch that moment in slow motion, watch what the hind legs do, then the front legs, then together. Watch the head and neck of the horse. What is the tail doing? What’s the rider’s position? You will find what created the glitch when you watched it the first time round. Eventually you will develop a feel, an “eye” for correct, healthy movement. And as a clicker trainer, you need this eye to land your click on the right moment when a movement is loose, relaxed and in balance. A workshop without bringing your own horse? When I go to Anja, people seem to assume that I go with my horses. But the great value of Anja’s workshop is that you get to see great riding and not watch someone who is just as bad as I am. What’s the value in that? There is a lot of value in watching great riding and getting real time explanations to why an exercise is chosen for this horse at this moment. That is important information for every trainer. And the person following Anja’s instruction knows how to do it correctly, so as you watch, you get a picture of how it should look like when done correctly. That is very precious and will enable me to do it at home, in my own time and my own style of training. And there are so many things you can do without trailering your horse away from home. The body awareness and Microriding we did with Alexandra were deep practice riding lessons. Movements were split into micro elements, practiced in slow motion and deep awareness and then put back accompanied by feedback from another person. Those are the elements needed for mastery. Our horses will appreciate that they could stay at home while we worked on our seat and training skills without them. Thank you Alexandra and Anja for being such generous, kind and outstanding teachers.